In my last post (Part 1), I began the “Cleaning Up the ‘Chan v. Ellis’ Mess” commentary series. My legal adversary, Linda Ellis, has caused a mess for many people with her reckless, irresponsible choices which was supported by other poor choices by her lawyer, Elizabeth W. (Betsy) McBride. After two years, I finally went back into the ELI Forums archive to find the original, unblemished version of the forum posts that Linda Ellis submitted as court exhibits. What I found was both distressing and upsetting to me. It showed not only how poor quality her court exhibits were but how much was left out altogether misleading the lower court. I believe it was an intentional act by Linda to shield certain facts that she did not want the lower court to see or know. Betsy did not did herself any favors by failing to vet her client’s so-called exhibits. She is going to get some blowback from what Linda did. Through strategic concealing, cropping, obscuring, and altering the photocopies of the original forum posts, the true context of the forums posts were greatly skewed against me. Because I didn’t have access to my computer or the original posts in the courtroom, I was forced to make do with the poor quality, misleading, and deceptive Ellis exhibits. In my last post (Part 1), I directly confronted and called out Linda’s false assertions within the WXIA TV interview. I am now continuing to directly challenge and refute the other false assertions she is making about me (out of context) on her Facebook page and other websites. “Hearse Song” exhibit post with lyrics overlay. In the “Hearse Song” Exhibit that Linda provided, the first point I want to make is that I wasn’t the person that posted it. It was April Brown, author of “Poetic Justice”. This one simple point is clearly seen even in the modified court exhibit. Even if it had been a veiled “death threat” (which it wasn’t), I didn’t post it plain and simple. The second point I want to make about this exhibit is that you see lyrics next to the YouTube screenshot. 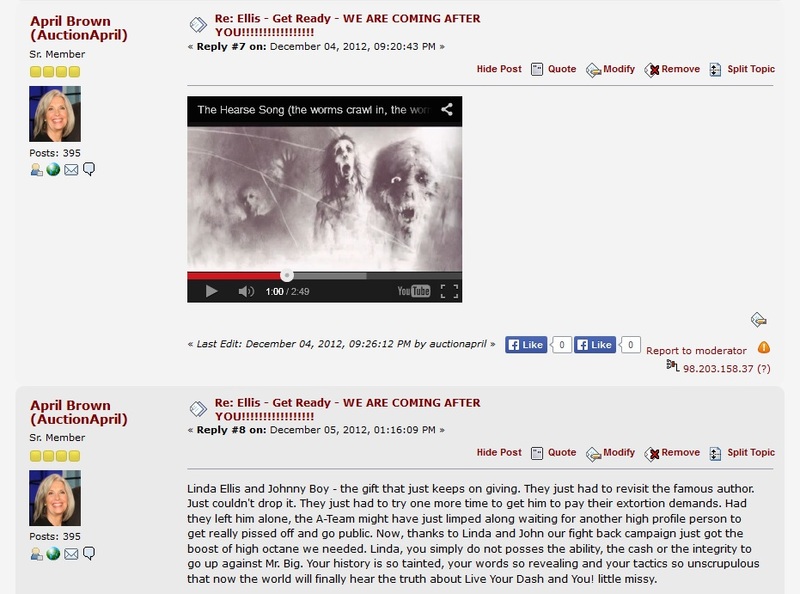 It implies that the original forum post contained visible lyrics, hence, conveying a written message of death. You will see below that the actual forum post was far less “threatening”. Original “Hearse Song” post plus a follow-up post for context purposes. The original, untouched forum post of the “Hearse Song” did not have any text or lyrics whatsoever. It contained no lyrics, text, or comment, only April’s lone post of the “Hearse Song” YouTube video. I included, in my screenshot, one of April’s follow-up posts to show the proper context. As you can see by April’s comments, April was angry that Linda was trying to go after the California author who had received the $100,000 demand letter. April was certainly angry at Linda but at no point is April even hinting anything violent or physical against Linda, much less a “death threat”. 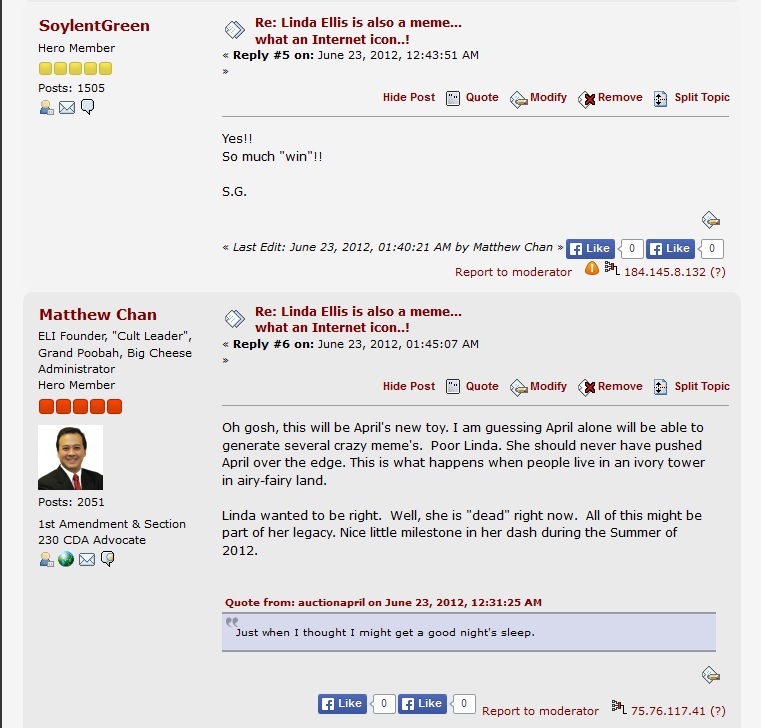 Another complaint Linda made was the title of the forum post “Ellis – Get Ready – WE ARE COMING AFTER YOU!” which was actually the 6th carryover title from the original first forum post. Below is the first three posts of that forum discussion. I wish I had a copy of it at my original hearing but I didn’t know what Linda had as “evidence” beforehand. My team and I never imagined I would be dealing with highly modified, cropped, obscured, and incomplete screenshots. I naively assumed that any screenshot of forum posts presented to the lower court would have been reasonably clear and complete and that most of them would speak for themselves as NOT being physically dangerous. Again, I was quite naive. 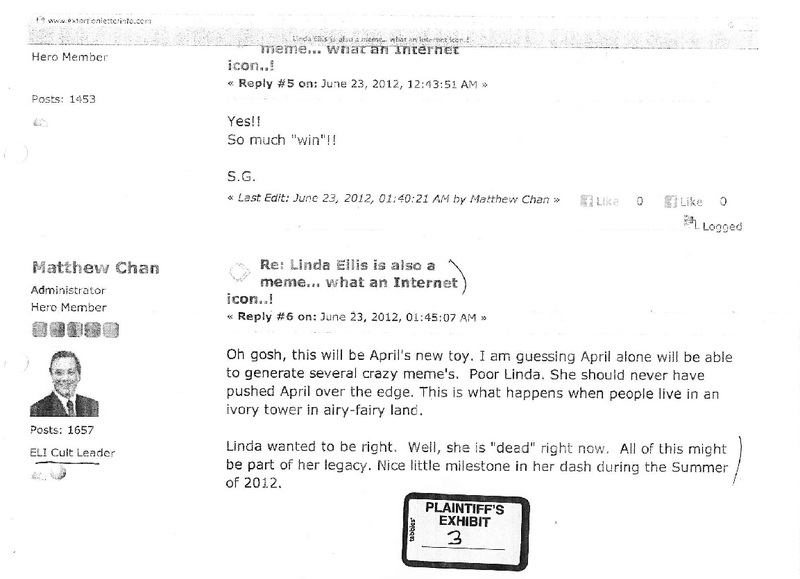 As you can see, April was the originator of the discussion thread “Ellis – Get Ready – WE ARE COMING AFTER YOU!” and it was concerning Linda hiring Atlanta lawyers to issue a $100,000 demand letter to the California-based author. April expressed her anger by naming a forum topic the way she did. But if you read the first three posts and all the subsequent posts, the discussion is far tamer and largely surrounds others reactions to the $100,000 demand letter. No physical threats of any kind were express much less a “death threat”. 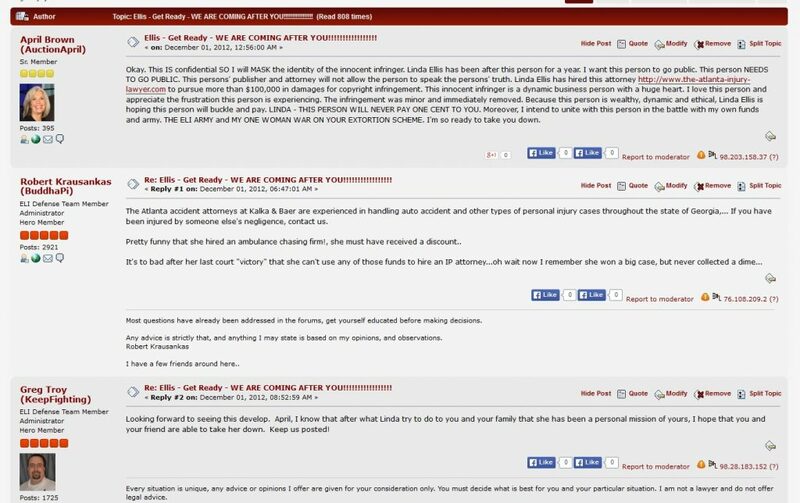 The next forum post relating to the “death threat” assertion is Linda’s Exhibit where I make a comment about Linda being “dead” right. As you see, the word “dead” is in quotes. It is a figure of speech being “dead” right. Compare the exhibit version to this one, the uncropped version of that forum post. Once again, you can see that Linda conveniently leaves off the quoted text written by April which my post was responding to. It had nothing do do with physical threat or violence much less a “death threat”. And yet, Linda considers all of these disparate forum posts as “death threats”. As a final comment on Linda’s “death threat” assertions, Justice Keith Blackwell rather astutely observed that Linda’s poem is often associated with “death and a tombstone.” I need not say anything more regarding the issue of death as it relates to Linda. I find it both amusing and sad that Linda seems to think that calling me a “cult leader” might actually convince someone that I am one. It is true that I have referred to myself as a “cult leader”. Does it really need to be said that it is meant as a “tongue-in-cheek” title? In any case, I did write a commentary on my “cult leader” status on January 11, 2015 titled “Can I Convince You I Might Be a ‘Cult Leader’?” However, what I left out is where it actually came from because I forgot when I first used that title. 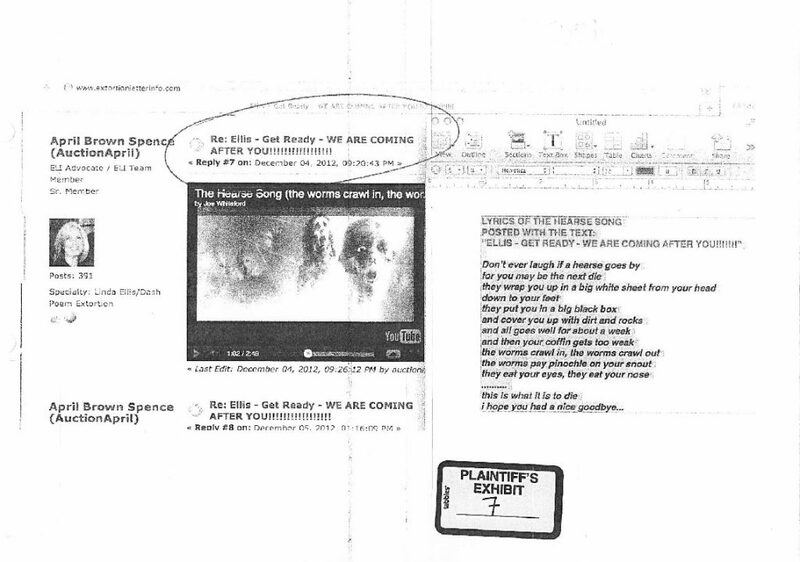 In looking through my computer files, I came across a rebuttal letter from June 2012 that I wrote to Seattle attorney Timothy B. McCormack in response to his unsolicited, unwelcome letter to me and Oscar Michelen regarding his views and remarks about my opinions of recording telephone conversations as a defense tool against overly aggressive collection calls from copyright extortionists. Although that whole communication between me and Timmy McCormack had NOTHING to do with her whatsoever, Linda has “adopted” this one paragraph from that 17-paragraph letter to share with others. She can knock herself out with it. In many ways, it would really be cool if it was true. Alas, I know my influence and charm is relatively low. I am not delusional in that regard. This concludes Part 2. Check back soon for Part 3. I am so thankful you are taking time to put all this into context. Even I didn’t know the origin of the “cult leader” snark. I’ve pondered many times why McCormack and Ellis have gotten away with this behavior for so long. At what point did they discover that altering evidence, outright lying and planting stories created “wins” for them. I do hope that when people read Poetic Justice more of their victims will come forward. How many people have been ruined by these two? IMHO every case either has been involved with should be reviewed by an impartial panel. I know that won’t happen, but it should. Neither have credibility. Another irritating aspect of Linda Ellis is that she wants to be known as a victim and she’s created this image of a Godly and delicate southern belle who is being attacked by Matthew Chan, April Brown and now 7 Supreme Court Justices! Maybe it’s just the circles I travel in, but none of my female clients, friends, associates or any other woman I know casually, professionally or personally actually wants to be known as a victim. She wears this manufactured image like new skin. I attended the Supreme Court hearing and I saw the faces of those justices and they did not buy her act at all. I wish there was a camera view not only of every judge but the gallery. Their disdain was palpable. She fails to realize that successful astute men (judges) do not associate with women who act like she does. Those justices are likely married to women (and maybe men:) who are respected educated equals. Men expect women to be strong and capable. I would agree that Ellis is not strong or capable and I would describe her as narcissistic, but outside her FB world, she has zero support, yet she doesn’t get it. I don’t think she is prepared for the backlash from the media and Internet community. She is a bully and sews hate and resentment. Her attempt to spin this story has failed miserably. I will add one more thing. Matthew Chan was “chosen” as her public target because he is a younger man not a senior like myself. . He’s fought back many times and his detractors have planted stories about him to damage his reputation. Linda Ellis has been doing that to me for 3 years. Now when you search April Brown, Charity Auction World and Whisker City, those false and damaging stories are now part of my story. One can only have sympathy for celebrities, politicians and activists. They pay a price for notoriety and change. There is a Part 3 and a Part 4 coming. There will be as many parts as it takes to clean it all up. When I get to a stopping point, I will then recap it all. So much crap to clean up. Linda is throwing it everywhere and her actions will likely impact her associates very soon. They are forcing me to revealing stories I have been holding back. But if that is how Linda wants to play it, we can all continue down this yellow brick road. Matthew, you must tell everything. It is important that the media has the truth. I also think at least one or more of the Justices is watching the aftermath of their decision. They need to see this evidence. Judge Jordan will eventually find out that he was duped as well. One can only hope he will learn the importance of being informed. He should have gotten on the Internet during the hearing and read those posts for himself. I have committed to writing as many segments necessary to correct the record. As of this posting, Part 3 was posted and I have begun Part 4. It seems likely there will be a Part 5 and 6 now. I don’t really know how many parts it will take. I am being organic with the process starting with the most “important” issues and then drilling down to the smaller more obscure aspects.